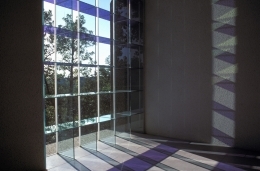 STRUCTURAL GLASS PRISMS - Projects - James Carpenter Design Associates Inc. The window is an optical device that projects a contemplative array of dynamic visual information into the chapel space. Structural Glass Prisms from James Carpenter Design Assoc. on Vimeo. The windows created for the Christian Theological Seminary’s chapel transmit light information into the chapel, transforming the space into a reflecting vessel. The 32 foot high glass blades are stabilized with horizontal panels of dichroic glass, creating an all glass structure. Two reflected and two transmitted images are projected from each horizontal glass section, creating reflection and transmission patterns of remarkable complexity that change over the course of the day. The colors change as natural light moves into the room from the southeast before noon to mid-afternoon, tracking a subtle and complex path through the space. The images and movement of clouds and birds passing through the sky are directly projected into the space by the upward slanting bars of light. Simultaneously, wind movements of leaves from the adjacent trees are projected into the space by the downward slanting bars of blue light, thus creating a superimposition of landscape and sky. Of critical importance to one’s reading of the phenomena, is the appearance and disappearance of the image based on the fluctuations of the sky brightness. The images shift from absence to a muted presence, to moments of crisp, intense legibility, connecting the viewer to the variables of the outside world.